Congratulations on your new little baby! Whether you are expecting or recently welcomed your new baby to your home, you probably have some questions about what to expect with a newborn. Being a new mom is quite overwhelming. Trying to implement Babywise while also trying to figure out how to be a mother presents the parent with a myriad of newness that can lead to the mother to fail to recognize key principles to abide until months have gone by. I know I did it! We can get bogged down in rules and fail to recognize the “why” behind what the rules are. We can miss simple steps that can make life easier for us and our child. 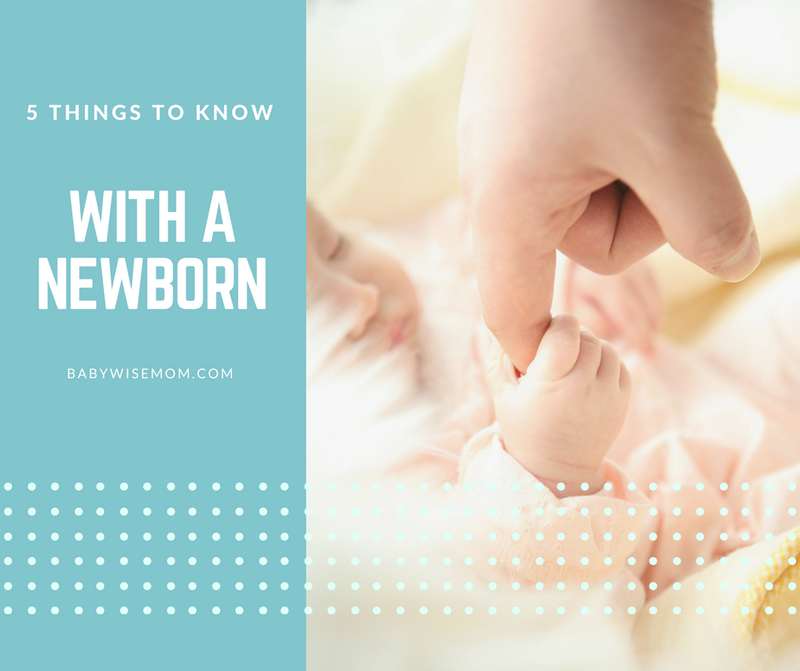 In an effort to help new moms avoid missing some key principles, I have created this list of important things for you to know now, before you go any further in your parenting journey. Know what it is you are working toward. What are your goals? What are the goals of Babywise? What can you expect over time? Knowing these things helps you to be willing to be consistent and also allows you to have the courage it can take to be flexible. It helps you through the monotony of it all and can bolster you through the hard times. Part of why a second, third, etc. child can be easier is that moms know that the efforts are worth it, that they pay off, and that stages don’t last forever. For your first child, you have to live on faith that those things are all worth it. Knowing the big picture also helps you to step back and say, “Hey, my baby is supposed to be doing xyz now and is not. What could be the cause?” It can help you to catch problems before they are huge. This is as true of sleeping and eating milestones as it is of gross motor and speech milestones. Early intervention is a powerful thing. The sleep hierarchy is something I created in an effort to help prevent parents from driving themselves to the point of insanity during those early months. There are always so many questions of, “Can I pick the baby up if she won’t fall asleep? Will it ruin her? Will it ruin all of our effort so far?” Know this hierarchy. Recognize the consistency it encourages as well as the flexibility it allows. Understanding waketime length is one of the most powerful tools you can give yourself as a parent. Know what the baseline is for about how long a baby your child’s age should be awake. Know the cues to watch for to know when baby is tired. Know the signs for overstimulation–avoid this from happening. Also, know how to keep your baby awake. It can be hard to keep most newborns awake! Understand that waketime length is important enough that it leads to the sleep hierarchy. An overly tired baby will not sleep well and will not eat well and will lead you down a frustrating spiral of no success. Also know that you are human, you are doing this for the first time, and you will make some mistakes as you figure this out. I made mistakes the fourth time around and believe me, I know this stuff inside and out. You don’t write about it, answer questions about it, and apply it for 12 years and not be able to explain it while half asleep. I still made mistakes. You will, too. Guess what? It will be okay. Babies are quite resilient. Give yourself grace, learn from the mistake, and move forward. A principle of Babywise is that baby will fall asleep without sleep props. The path you take to get to that goal is not important, however. There are many ways to reach this goal. Know what you are comfortable with and what you will be willing to see through to the end. Follow that path. There are important things to know when it comes to feeding your baby. Not all of them are inherent. One key thing to know is that you need to keep baby awake and engaged while eating. A baby who naps during a feeding will have a harder time sleeping at nap time (think of yourself if you take a nap at the wrong time–how does that impact your night sleep?). You also want to make sure that you accept and address growth spurts. Growth spurts are normal and are part of a baby’s growth–a HUGE part. They are not signs that anything will go wrong. A growth spurt isn’t something you fix. It is something you whether, and your baby will go back to “normal” once the growth spurt is over. Nursing A Newborn: Keep Baby Awake! Feeding a Newborn: How Long Is a Feed? 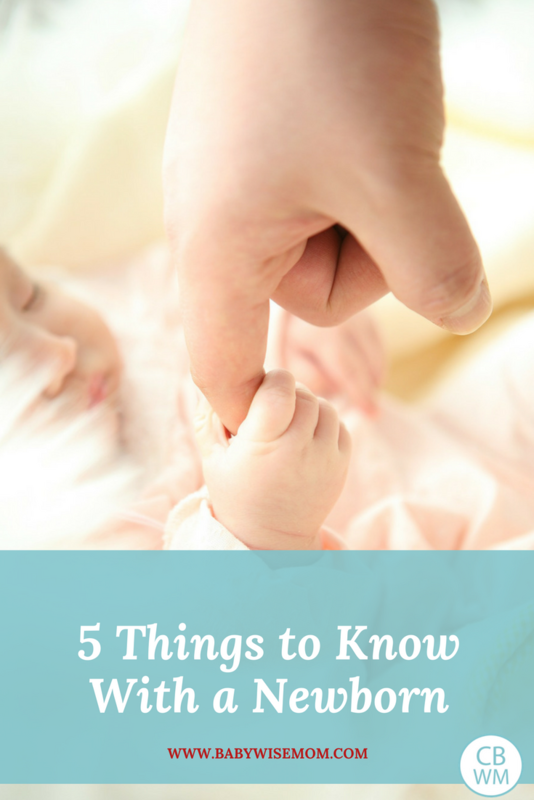 These five things to know can help you to have success with your newborn. Keep them in mind and you will fare well! Next Post Brinley Summary: 5 Years Old! Hi Valerie! My name is Cassidy… thank you so much for all of your helpful articles! I am expecting my first baby in two weeks and I've been studying up. I have a question.. I noticed that you are LDS. Do you have any advice on when to bring baby to church? I really don't want to miss sacrament meeting at least and I just got a new calling as a primary teacher. If I don't let people touch my baby, is it okay to bring her back to church right away? I know this isn't related to sleep training at all, but I'm looking for answers 🙂 🙂 Thank you so much!